There are islands off the coast of Norwich. People ask me about the similarities and differences between Norfolk and Suffolk, and in truth I think that the two counties are very similar. Norfolk is a lot bigger, of course, and emptier, especially towards the west. But the biggest difference between the two counties is their relationship with their county towns. Ipswich, above all else, is Suffolk distilled and amplified, the working and historic county translated into an urban setting. Industrial Ipswich was the fountainhead of the county's agricultural production, the docks an interface between Suffolk and the world. To know Ipswich is to know Suffolk. But Norwich is different to Ipswich, and it is different to the rest of Norfolk. As you enter the city you pass hoardings which proudly proclaim, in George Borrow's words, that you are entering Norwich, a Fine City! It is like crossing a forcefield. Norwich is a fine city, and it is also a small city; however, Norwich is so far from any other place of equivalent size - Ipswich is 40 miles away, Cambridge nearly 60 - that it is completely out of scale to its population. If Norwich were dropped into South or West Yorkshire, or Greater Manchester, it would disappear. Here, it assumes the importance of a Leeds or a Sheffield, cities four times as big. At times, Norwich can feel like a great European city, living a technicolour life in the soft, pastel setting of its rural hinterland. Its industrial past, in shoes, textiles and chocolate, was not grounded in the local countryside in the same way as the industry of Ipswich. In the 1960s the University came, and Norwich's nightlife is lived by people who have, in fair proportion, not grown up in Norfolk. To set off from Norwich is to enter a countryside that feels different. It is like leaving a shore for the open sea, a sea with islands. The soft fields of Norfolk wash right up against the edge of the city, insulating villages that would have been absorbed if she had grown any larger. Just a mile or so from the edge is Bawburgh. 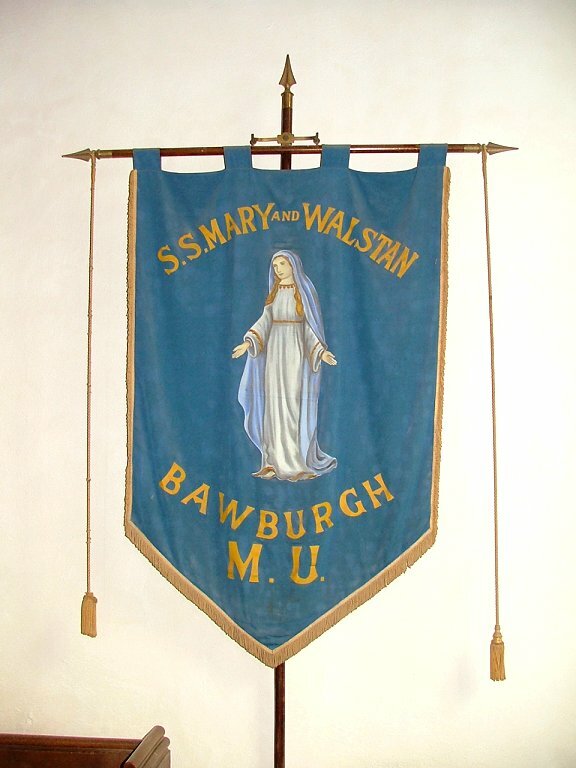 Every island has a story, and Bawburgh's is the story of St Walstan. 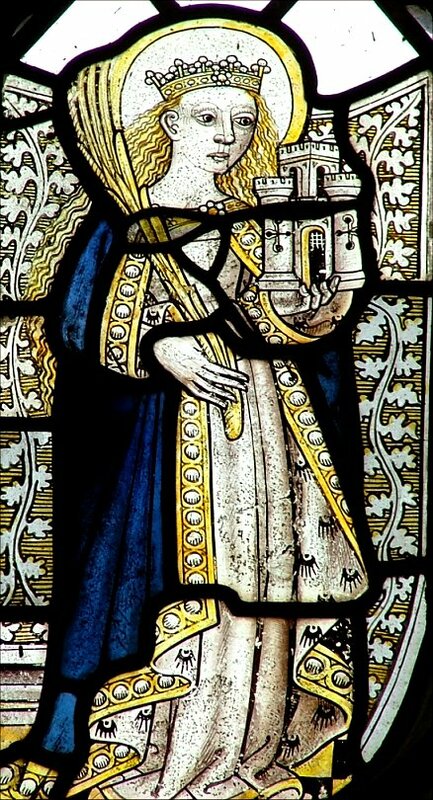 St Walstan was a Prince, the son of Benedict and Blid of the royal house of East Anglia. Blid would herself become a Saint. He was born in Bawburgh, or perhaps at the royal vill of Blythburgh in Suffolk. As a teenager, he followed Christ's instruction to renounce all he possessed and become a disciple. Giving up his claims to succession, he did not delay to reach northern parts, as the Nova Legenda Anglie tells us, and humbled himself to be a farmworker in central Norfolk. After a series of adventures that revealed his saintly character, one of which involved him being rewarded with a pair of young oxen, he received news in about 1015 from an Angel; he would die and be received into heaven in three days time. 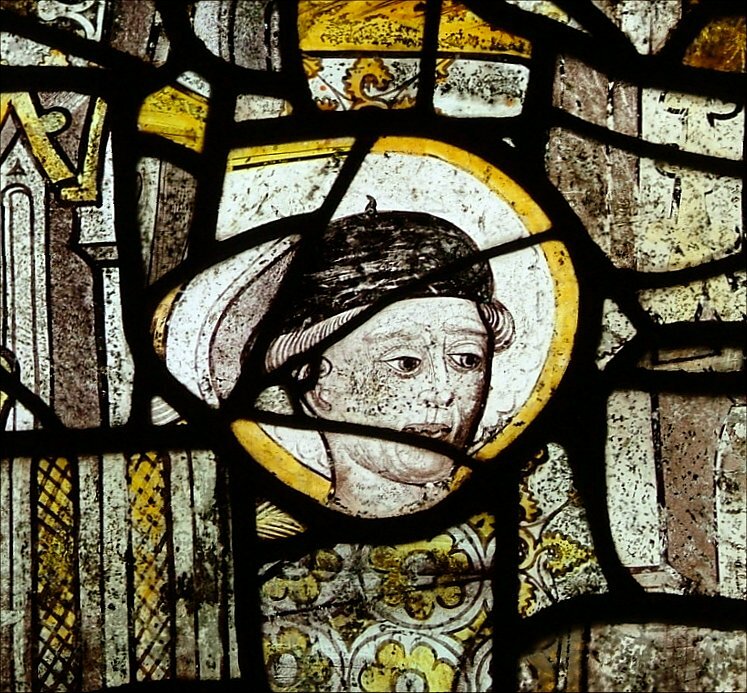 With typical East Anglian stoicism, he nodded his head and left his scythe to go and find a Priest to receive the Last Rites. Unfortunately, the Priest had no water, but, magically, a spring welled up where they stood. 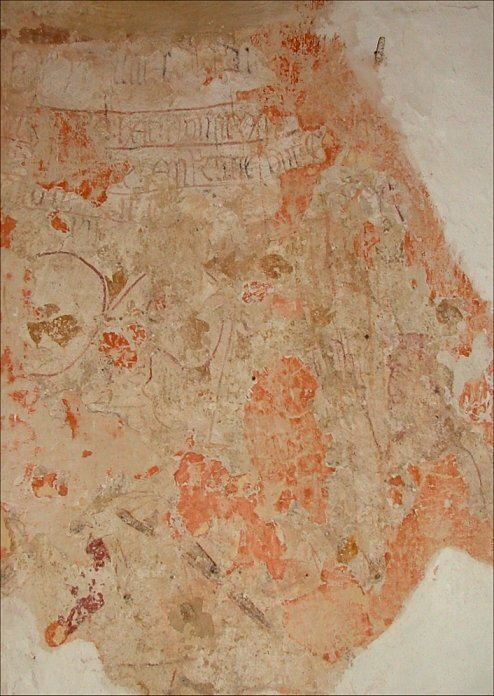 This was in Taverham, and when Walstan died the two oxen carried his body on a cart to be buried at Bawburgh. On the way, they stopped to rest in Costessey, where another spring sprang up. At last, they came to Bawburgh. They stopped outside the church, and a third spring appeared, the biggest. And then, the Nova Legenda Anglie tells us, Angells opened the walls in hast, and the two oxen with their burden walked into the church. 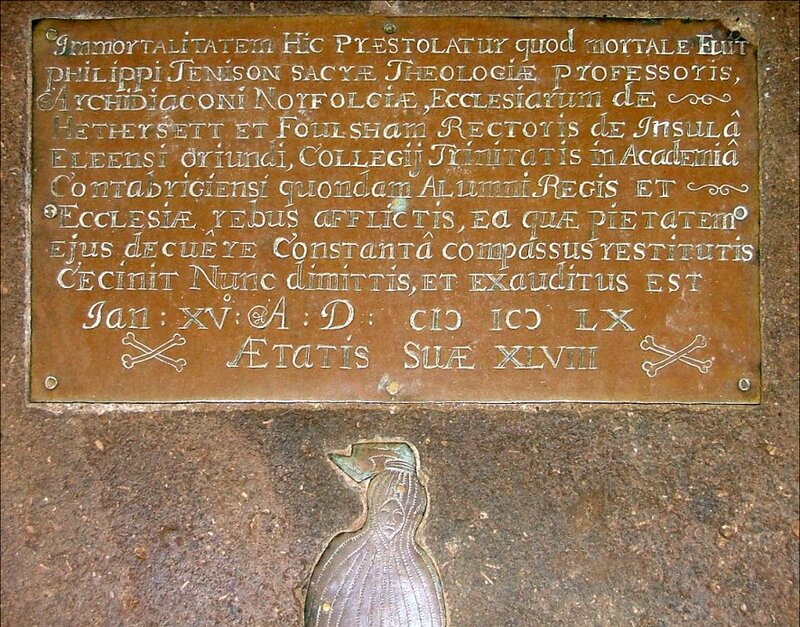 Walstan's body was placed in the church, becoming a site of pilgrimage for people who sought miracles and healing. Eleven miracles have been handed down to us. The St Walstan legend is interesting for all sorts of reasons. 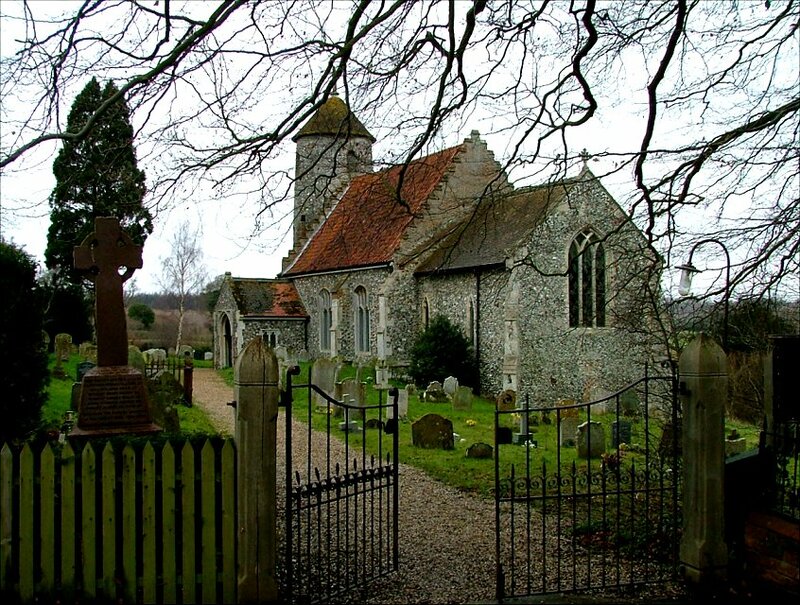 Compared with the West Country, survivals of local Saints' cults are very rare in East Anglia. 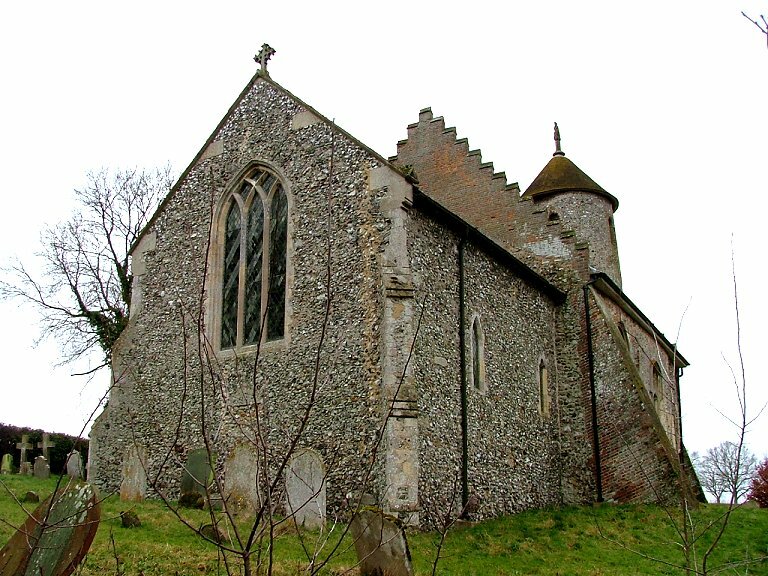 This part of Norfolk was strongly recusant during the penal years, and it is likely that local Catholics kept stories of Walstan in their tradition even after the practice of devotion to him became impossible. 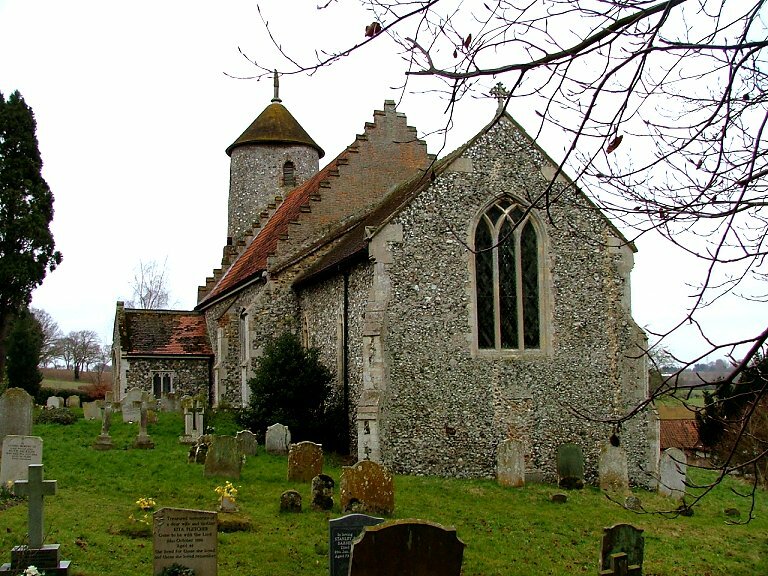 When the penal years ended, the new Catholic church at Costessey in 1841 was dedicated to Our Lady and St Walstan. 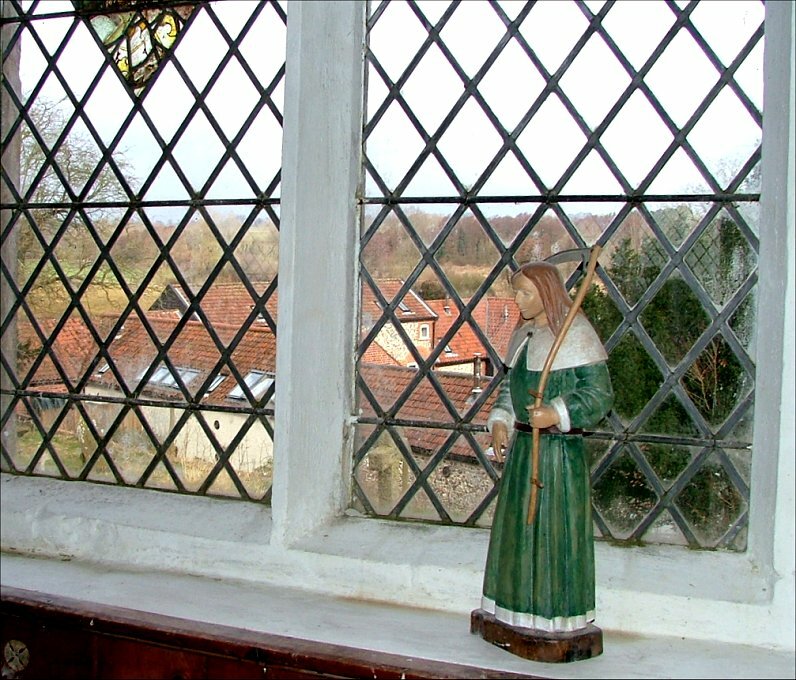 Although there is no evidence that the Saint was part of the original dedication of Bawburgh church, the foundations of which certainly predate the St Walstan legend, it bears the name today, and that is because the relics of St Walstan continued to be important right up to the Reformation. 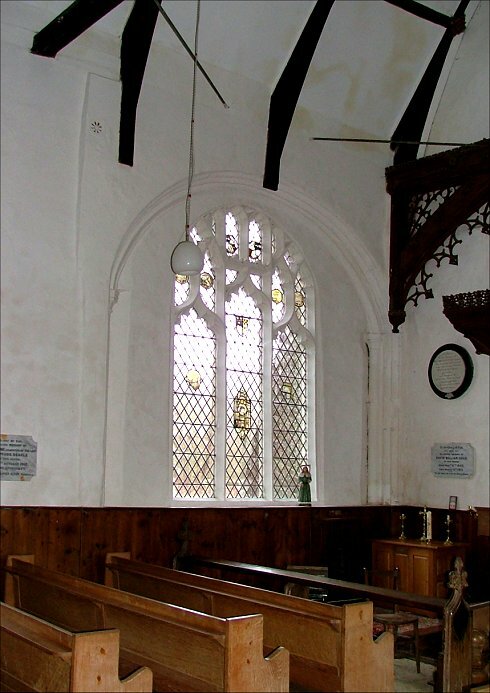 Bequests made to the shrine are recorded in late Medieval wills, and these in turn were noted by 18th century antiquarians who restored dedications to parish churches, not always very accurately, after the long puritan night. During the late 14th century, when acts of pilgrimage were at their most significant, thousands of people must have made their way every year. On the north side of the church was the chapel that contained his bones. From this, a sunken pathway led down the steep hill to the well on the site of the third spring. Incredibly, this pathway was destroyed as recently as 1999, to be replaced by a sterile driveway that circumnavigates the farm to the north of the church. The date of the Walstan legend is interesting, right on the eve of the Norman settlement of England. 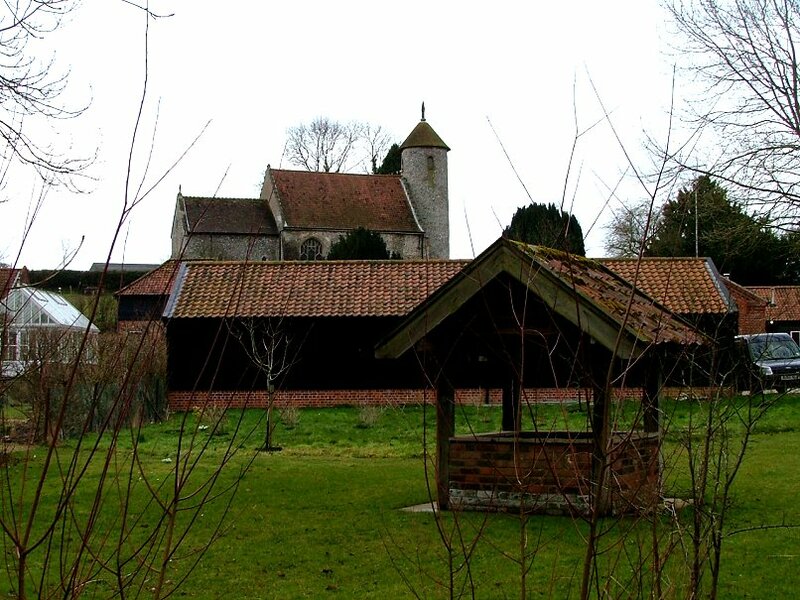 It is almost exactly contemporary with that much more famous legend, the founding of the shrine at Walsingham by Lady Richeldis. Could it be that the cults endured as a form of resistance by the Saxons, popular local legends in the face of Norman cultural hegemony? or was it that the Normans themselves who ensured that these popular pieities continued, nurturing them in the place of surviving pagan practices? 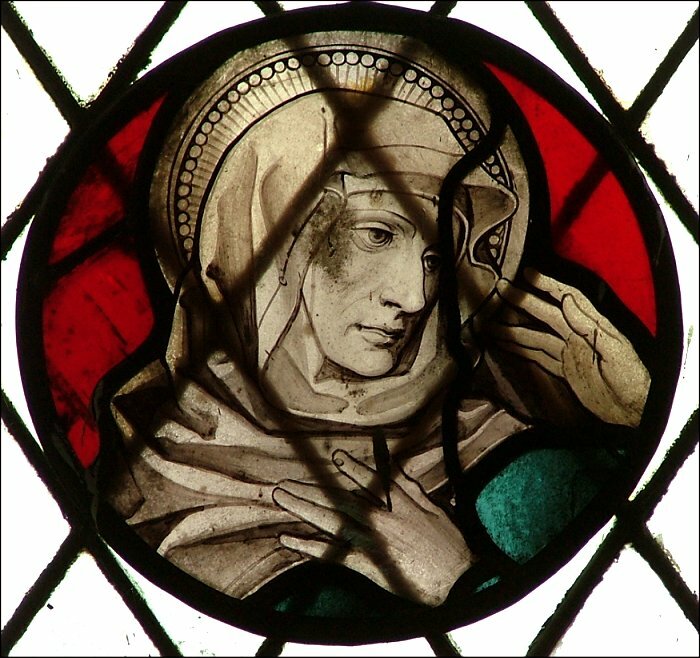 We can never know, but what is certain is that St Walstan's legend recommended him as a Saint of the ordinary people, a worker Saint if you will, which may explain his almost complete disappearance from popular English story after the Reformation. Two excellent books by local author Carol Twinch have helped popularise this very East Anglian figure. And, interestingly, in the latter half of the 20th century his cult has been explored increasingly by the Anglicans, at a time when devotion to Saints seems to be going out of fashion in that Communion. There are popular pilgrimages here every year still under the auspices of the Anglican Diocese of Norwich. Perhaps it is the simplicity of Walstan's life, and the healing nature of his miracles, that lend themselves particularly to the quiet nature of modern Anglican spirituality. 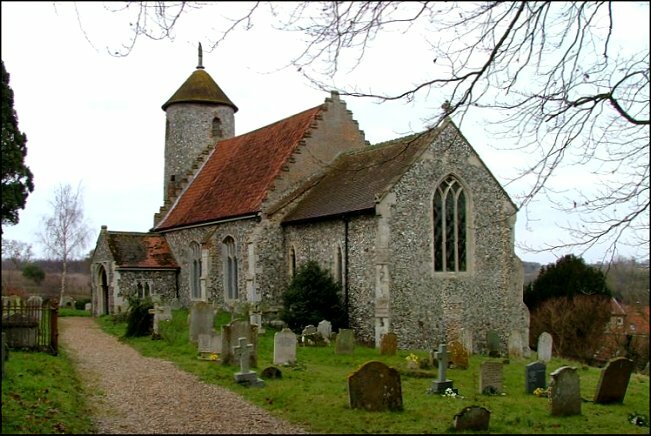 My good friend Peter Stephens lives in Bawburgh, and so I was particularly looking forward to seeing this church. In the winter just gone, Peter and I had spent several days of somewhat unpredictable weather exploring the churches of central Norfolk, and so I took it as a sign when we got to Bawburgh that the sun came out against all the odds. There were to be blizzards later in the day, and the temperature was still barely above freezing, but for a moment there was a feeling that spring was in the air, the earth renewing itself, the long cold winter coming to an end. I was pleased to be here, and I think Peter was too. Peter, lucky man, can see this church from his house, and what a beautiful church it is! 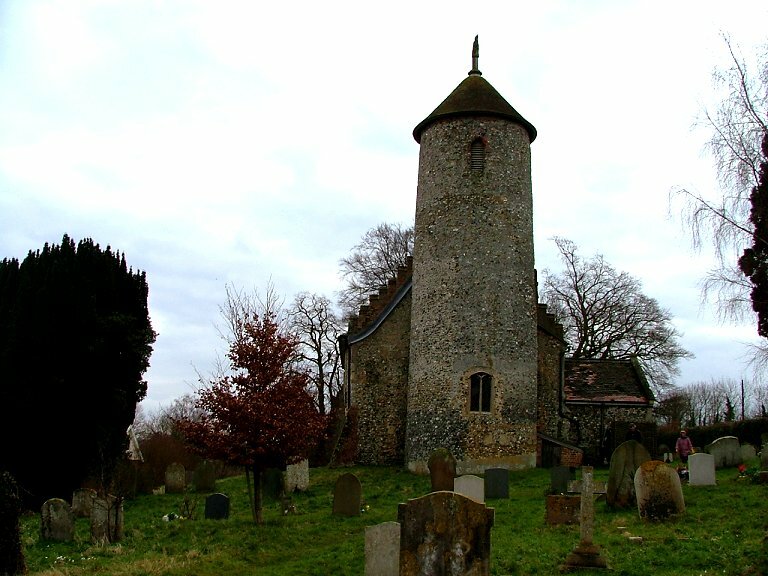 It must be among the loveliest of all East Anglia's 160-odd round-towered churches. 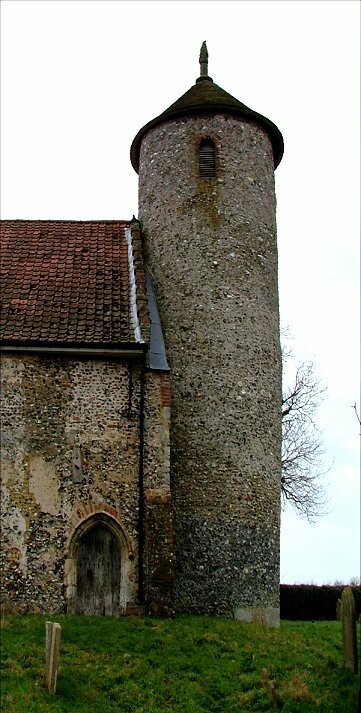 The stepped gables, the red roof of the nave and a little flame-like pinnacle on the cap of the tower collude delightfully, particularly in this dramatic setting on the steeply-pitched side of the ridge. The graveyard falls away dramatically on the northern side, and from here St Mary and St Walstan appears fortress-like. We stepped into a wide, simple interior, white walls and bare wood setting into relief sudden flashes of colour. How much of this church was here when Walstan's body was brought here? Probably, none of it. The archway to the tower is 13th century, and the windows suggest that the rest of the building is early 14th century. 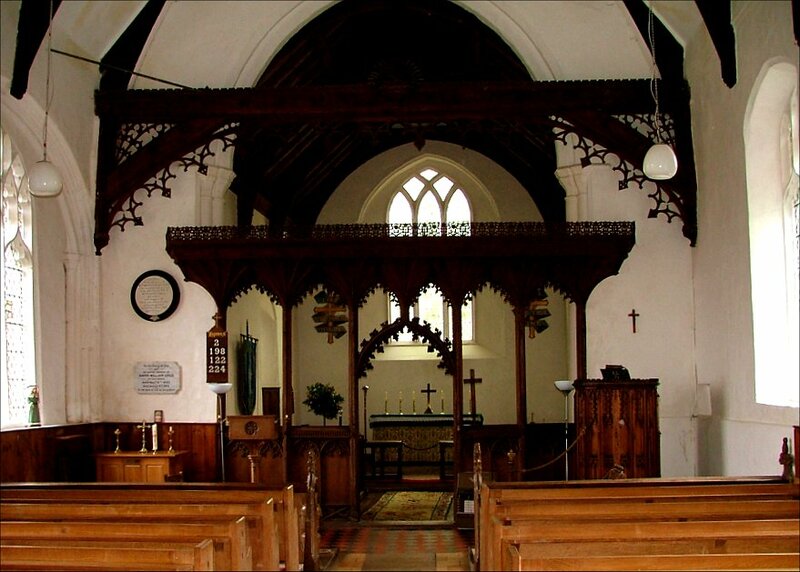 Quite probably, the whole church was rebuilt as a result of the prosperity brought about by the shrine of St Walstan. On the north side of the nave there is a large archway, a filled-in opening. For a moment I was tempted to think this was the wall the Angells had opened in hast, but it was probably the entrance to the later chapel of St Walstan, since this wall post-dates the St Walstan legend by 300 years. 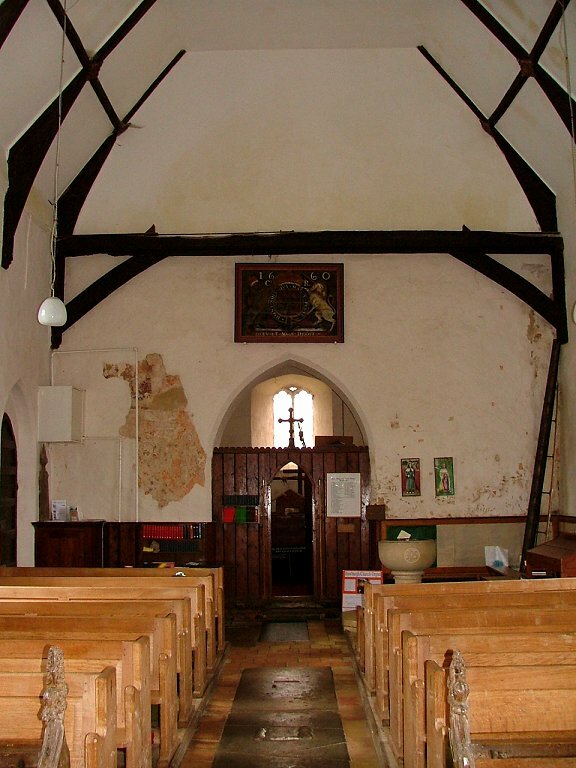 The remains of the 15th century roodscreen are made up rather dramatically into an early 20th century screen with bubbly cusping and a canopy of honour above, all of it unpainted. It is difficult to know how they resisted painting it, but I am glad that they did, because it suits the simplicity of the building just as it is. But there are plenty of survivals here of Bawburgh's colourful Catholic past. Most interesting of all, the collection of brasses. 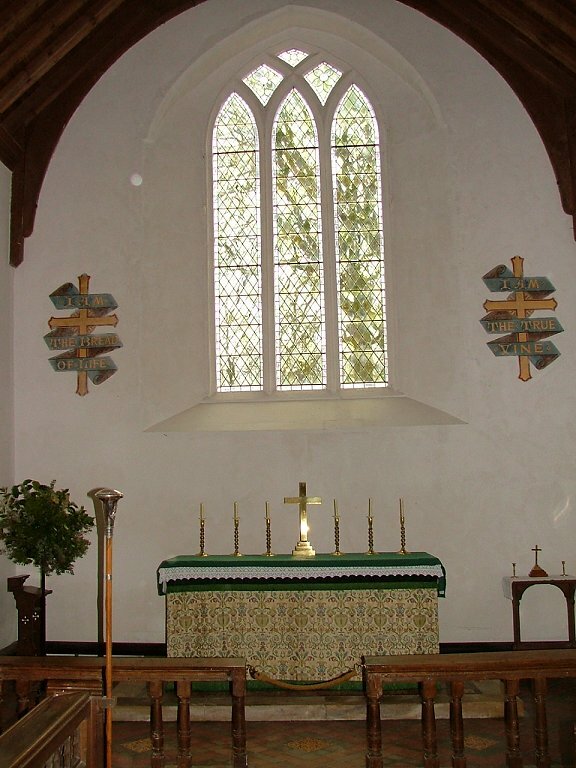 Bawburgh has two shroud brasses and a chalice brass. The biggest of these is Thomas Tyard who died in 1505. It is 60cm long, and he lies with the shroud partly open, his hands crossed in an act of piety. Beneath it is an inscription plate. 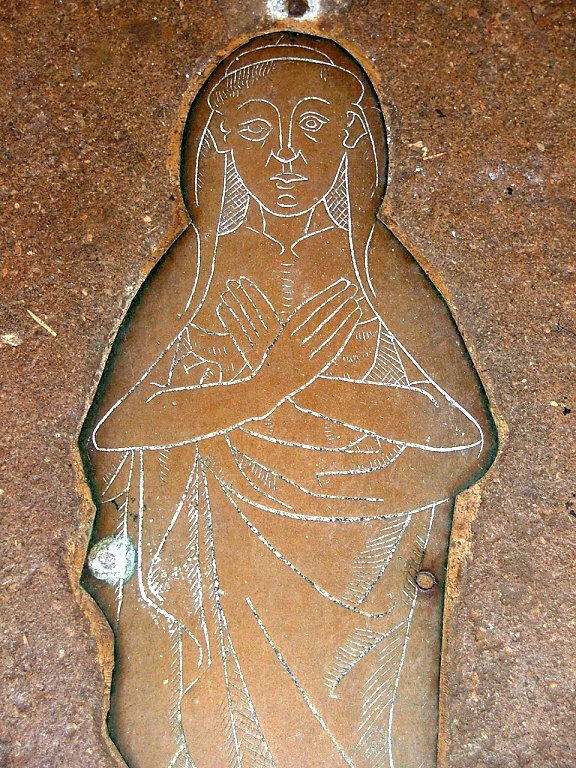 The other shroud brass is unidentified, and quite different; it depicts a smaller figure sewn tightly into a shroud, with just the face peeking out. It is so like the figures mounted on the wall at Yoxford in Suffolk that I assume it is a figure adrift from a larger collection, perhaps representing one of the dead children of a larger figure. 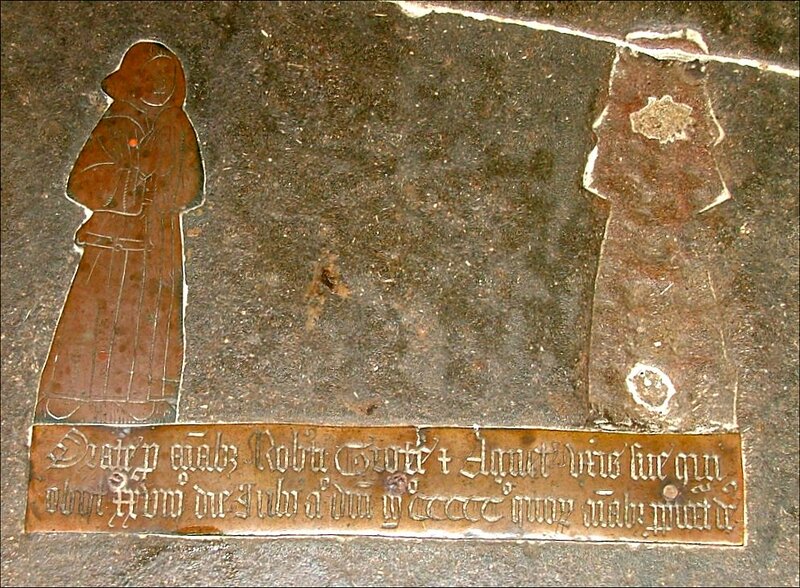 Set in between them is a late 17th century brass inscription and shield to a minister of this church, Philip Tenison. It is quite fitting that it should be here, because Tenison was an antiquarian at a time when such things were looked on with grave suspicion, and Carol Twinch notes that he recorded information about the Walstan shrine here that might otherwise have been lost to us. Deprived of his living by the Puritans, he later became an Archdeacon after the Restoration, in which case the date of 1660 here is obviously wrong. I think that all five of these brasses were reset here from elsewhere in the church by the Victorians. 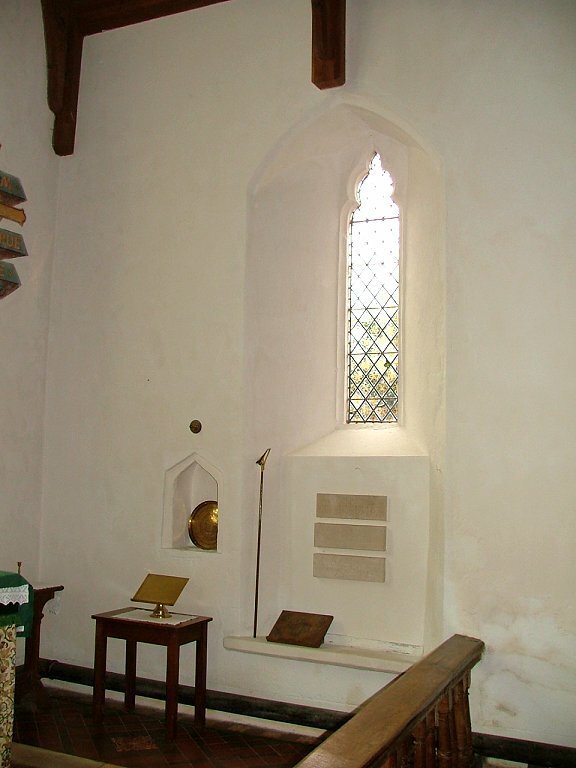 The chalice brass may well be in its original position. 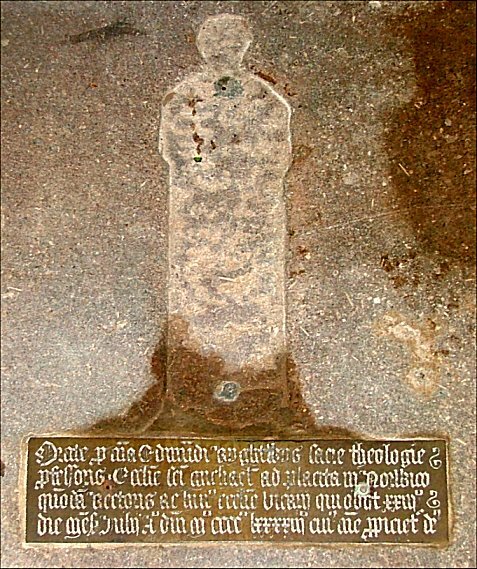 It is to the Priest William Rechers, and is right on the eve of the Reformation, 1531, so he would have been one of the last Priests to be commemorated in this fashion. The chalice is almost identical to the one a few miles off at Attlebridge. 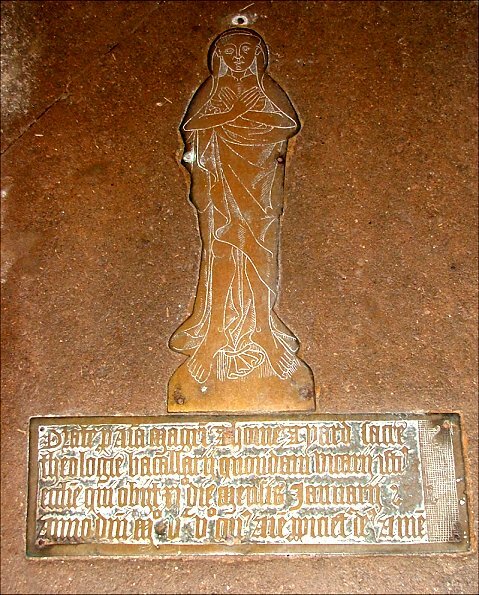 In the nave, there are three further pre-Reformation brass inscriptions, at least two of which are on their original matrices, and one of which retains one of the two figures commemorated, Robert Grote, who died in 1500. His wife is missing, as is the Priest Edward Kightling, whose empty matrix shows that he was wearing priestly vestments. This is a wonderful collection of late medieval brasses, and is extraordinary that so much has survived. Only a couple have been stolen, but it is clear an attempt has been made on the life of the smaller shroud brass; it has been broken in half, and the lower part protrudes upwards. It is firmly secured, but it is possibly the reason that the central brasses in the chancel are covered, to stop anyone tripping on it. Unfortunately, the carpets are drawing the moisture through the stone, and these five brasses were absolutely soaked, the latten oxidising. Perhaps the parish will find another way of caring for them. 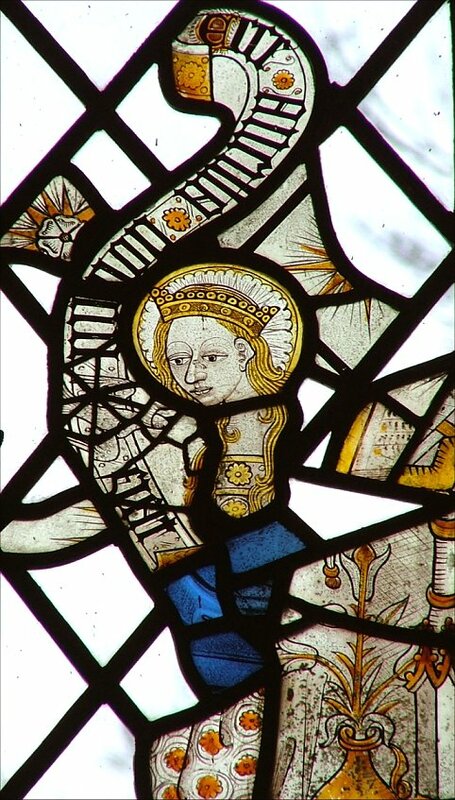 The most vivid memory of the past at Bawburgh is the superb collection of late medieval glass in the most easterly windows on both sides of the nave. 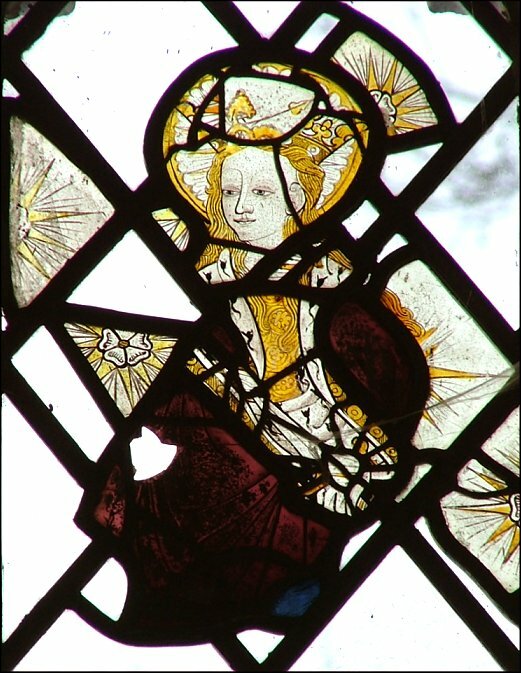 Best of all is the wonderful St Barbara, as good as anything else in Norfolk. She stands proudly, holding her church. 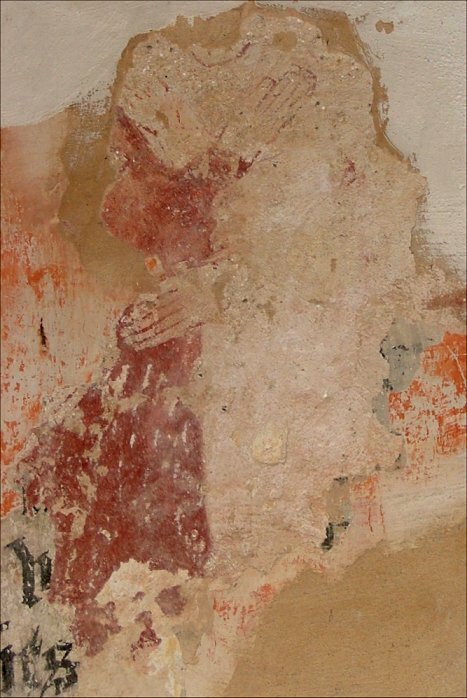 Across the nave is a lavely fragment of an Annunciation scene. Mary stands in front of a pot of lilies, and a scroll declares Ecce Ancilla Domini Fiat ('Behold the Handservant of the Lord, Let it be so'). 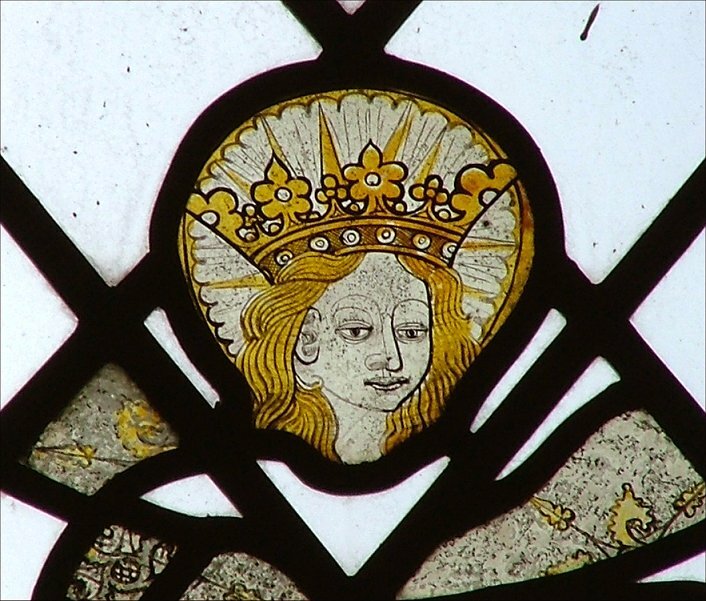 A crowned female head is probably from a Coronation of the Blessed Virgin. 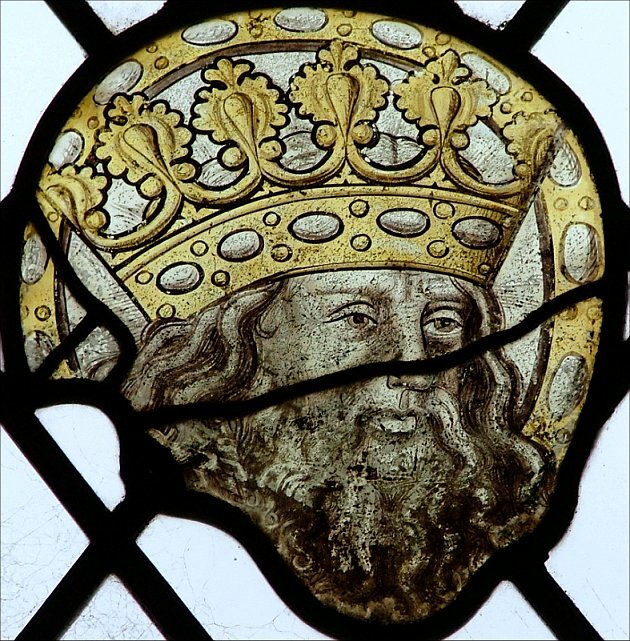 There are censing angels, a king who may be from the same Coronation scene, a larger, crowned, bearded king, some fragments of St Catherine and perhaps St Gregory, and a lay figure in late medieval dress who might just be a pilgrim to the Shrine of St Walstan. 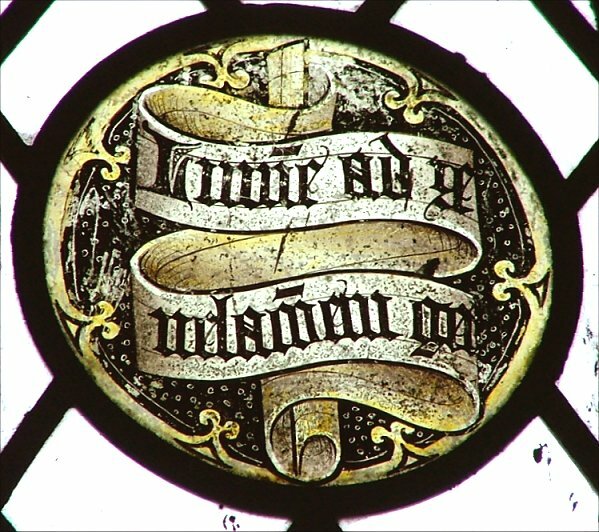 Perhaps most pleasing, because it is so complete, is a set of roundels featuring the words of the Nunc Dimmitis, Simeon's prayer on seeing the infant Christ for the first time. 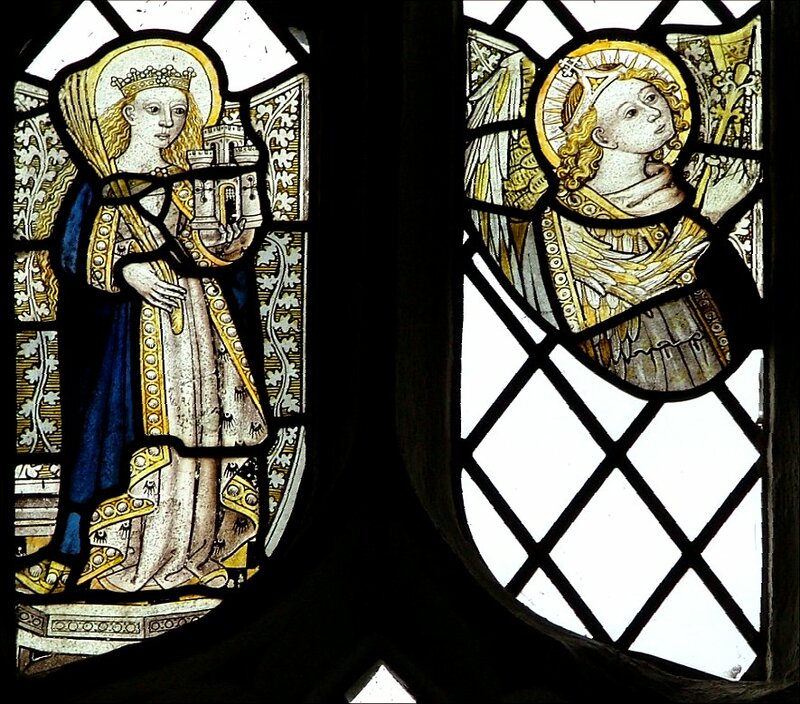 It is rather moving to find them in the same window as the Annunciation, which features words which would be familiar to pilgrims from both the Ave Maria and the Magnificat. It is easy to imagine them sitting telling their beads at a journey's end, contemplating this glass. At the west end of the church is a small patch of wall painting which defies easy interpretation. It is obviously two separate subjects, the upper appearing to be two figures embracing, the lower a roundel topped by indecipherable text. It is likely that they are part of a Seven Works of Mercy sequence, which was often placed on the western wall of a smaller church like this. There is much else besides. 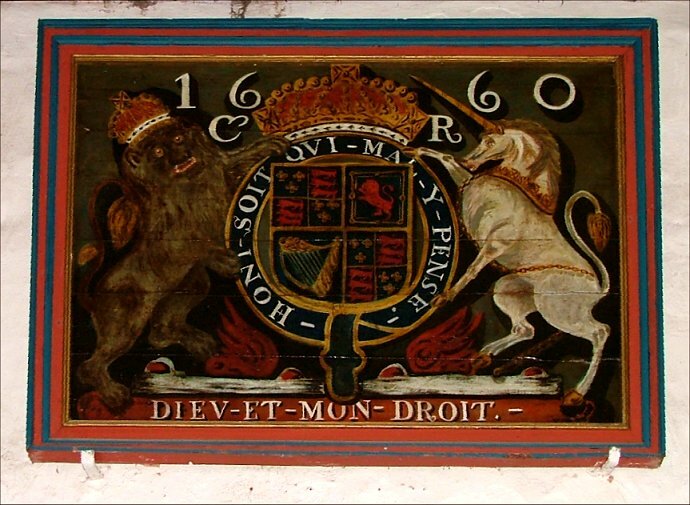 The people here were oviously very pleased at the Restoration, and immediately erected a new set of royal arms to Charles II. It is dated 1660, and you can't help thinking of Philip Tenison, and how it might just be his influence that the people were pleased to see the back of puritanism. 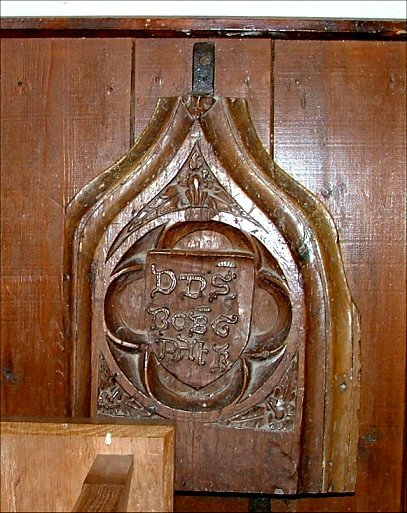 One old bench end is marooned on the wall, curiously in the shape and location of a holy water stoup (is it covering it?) and there's a nice European roundel in the chancel, which I take to be from a series of Stations of the Cross. Otherwise all is Victorian, or the influence of Victorians. 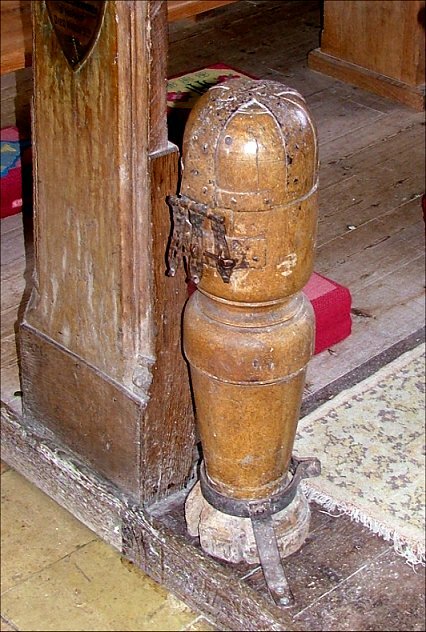 But don't miss the 17th century poorbox, still secured in the east end of the nave. 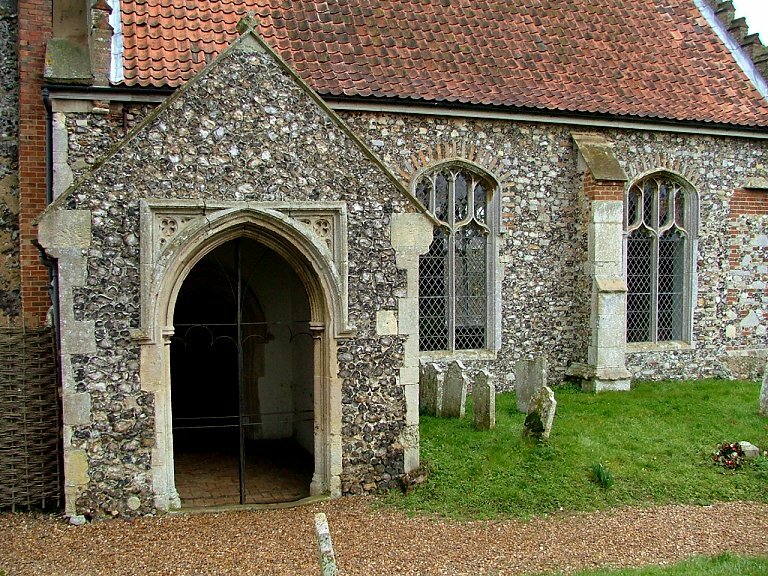 It is from the protestant days of this church, but it is still a reminder of charity, and the offerings of generations of pilgrims that made this one of Norfolk's most significant shrines, and still a beautiful and interesting church today.